FINISHING TOUCHES: Fred Lund contributes a portrait of Wes Chesbro in Becoming Independent's new show. In a warehouse buried deep in a southwest Santa Rosa business park, a group of 11 artists are scattered around a cavernous room working on their projects: beading, weaving and drawing. In one corner, decked out in powder-blue shutter shades and a Chuck E. Cheese baseball hat, William Eley paints his interpretation of a Mitchell Heinze illustration, while across the table, Daniel Poma works on a self-portrait. "We've done a lot of collaborations, he's my artistic soul mate," instructor Beth Hibbard says as she pages through Poma's portfolio, a series of colorful abstract impressionist paintings. "He's a fantastic artist—I hoard his stuff at home because I'm afraid someone's going to throw it away. He didn't start doing art until three years ago. He was shredding paper for 30 years." 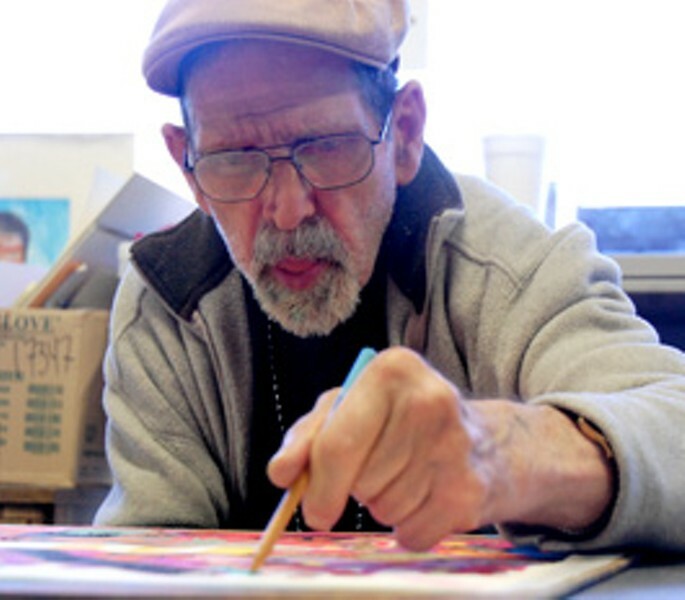 Eley and Poma are both part of ArtWorks, an offshoot of Becoming Independent, the North Bay's largest human-services organization dedicated to aiding people with developmental disabilities. The 10-year-old ArtWorks hosts exhibits at the Gallery of Sea and Heaven, a location triumphantly returned to this August after an 18-month closure for repairs. The latest, You're Perfect!, features portraits of local celebrities, an eclectic mix that features Efren Carrillo, Jean Schulz, Lynn Woolsey, Brent Farris, Bernie Schwartz, Tom Ammiano, Michele Anna Jordan, Tom Waits and many others done by a collaboration of community and ArtWorks artists. "It started with artists painting together," art production and gallery manager Barbara Harris says of the project's inception. "We've had so many wonderful people in our area helping us, so we thought, 'Why don't we include them?'" For community artists, working with the ArtWorks artists offers a refreshing, more intuitive approach to creating pieces, says Hibbard. "If you're too aware of what you're doing, it will deaden the work," says Hibbard. "You don't experience that with most of the artists here. There's a complete lack of inhibition; everything's really bold, decided and authentic." Hibbard lists several goals for the studio: increased national exposure, opening a dialogue with similar galleries and creating an online gallery of the works. Most important, however, is making sure the works are viewed the same as any other piece of art. "There is this separation between the art that we do here and [art] happening outside of our studio," Hibbard says. "[The artists] are being defined by their disabilities, and it's pretty obvious to anyone who comes here and has a sensitivity to artwork that this work isn't disabled. It's our job as advocates to try and blur those lines." 'You're Perfect!' opens April 30 with a reception from 5pm to 7pm, and runs through June 18 at the Gallery of Sea and Heaven. Wednesday-Saturday, noon-5pm. 312 S. A St., Santa Rosa. Free. 707.578.9123.